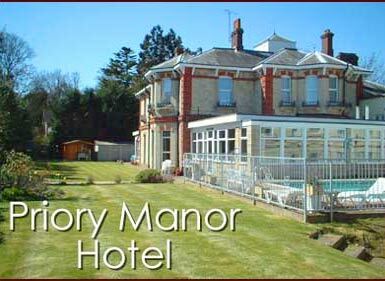 Priory Manor Hotel was built in 1887 as a private manor house and was tastefully extended and converted into a hotel in 1923. The conversion was carried out in a manner that retained all the building´s splendour and period charm. The hotel lies in its own grounds whilst retaining the peace and tranquillity of its rural setting. It is only a few minutes walk from the centre of Shanklin Old Village and Rylstone Gardens. The hotel is a short walk from the famous cliffs, which give superb panoramic views over some of the Island´s most beautiful beaches. The Priory Manor Hotel is situated at the top of the oldest Isle of Wight attraction, Shanklin Chine, which is open every day. The hotel boasts 38 large, spacious bedrooms with each having en-suite bathrooms, radio and colour television plus tea and coffee making facilities. The accommodation consists of twin, double or family sized rooms that allows parties of any size to be catered for. The Priory Manor Hotel has a licensed bar and restaurant that can seat up to 100 guests. We can cater for wedding receptions, functions, coach and private parties and can accommodate for special dietary needs, ensuring all guests have an enjoyable meal. Amongst the hotel´s many amenities, there is a large function room with dance floor and small stage, which is ideal for all types of functions including wedding parties. The function room overlooks the gardens and the heated swimming pool. The hotel boasts an area for the younger guests equipped with games and pool table giving them the chance to enjoy themselves whilst Mum & Dad relax in the bar.